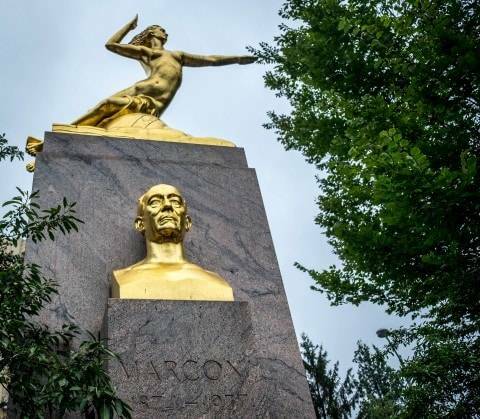 Statue of Guglielmo Marconi at 16th and Lamont streets NW, in Washington D.C Above the bust of Marconi is a female figure representing electricity. A lot has changed since I first moved to the Washington, DC area in the mid 1980’s. When my family first arrived from New York State, we were the only Italians in our neighborhood. Procuring Italian products from the local supermarkets was almost impossible. I remember joking with a friend who used to forage basil from Rock Creek Park because he couldn’t find it in stores! That was, of course, before “we” all began growing our own herbs and vegetables to fill our insatiable culinary nostalgia. Whenever we did meet Italians, or Italian-Americans, everyone would lament about there being no Italian community in Washington. Even as a young teenager though, it struck me as odd that this very capital city in which our American forefathers incorporated Italian inspiration, was known for its lack of Italian influence. 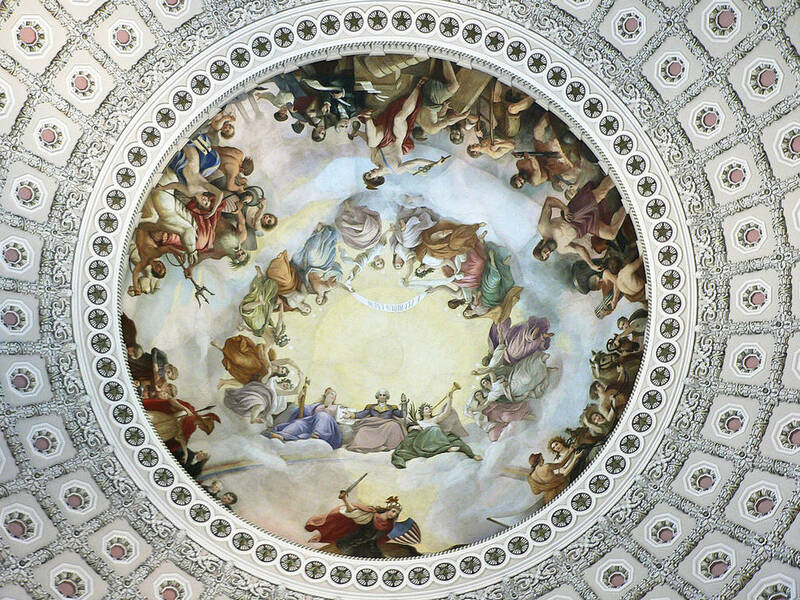 I began seeking refuge in the rotunda of the capitol building, the Library of Congress, and the Smithsonian art galleries –such as the National Gallery of Art, the Hirschhorn Museum, and the more recent National Museum of Women in the Arts, where Italian names and aesthetic sensibilities were plentiful. Making friends with Italians in the diplomatic community and those who came to work (usually at World Bank, the IMF, or NIH) was another way to construct a personal sense of community. Ever since those early days, it became somewhat of a mission of mine to explain the Italian roots of DC not only to new Italian members of the community, but to the community at large. Once all of the historical roots and synergy between America and Italy are understood, it would be very difficult for an Italian-American not to feel at home here. In future articles, I will focus on more modern aspects of the Italian scene in DC, but for this initial piece, I feel that a historical overview is the best guide to all of the Italian – influenced federal flavors. Former Washington, DC Mayor Adrian M. Fenty said “Other American cities may have larger Italian populations than ours, but it’s hard to visit a neighborhood in the District without seeing evidence of the artistic and architectural influences of Italy. He also stated, “Italy’s roots run deep in the District of Columbia.” I couldn’t agree more. Many of our monuments are in honor of Italian historical figures. 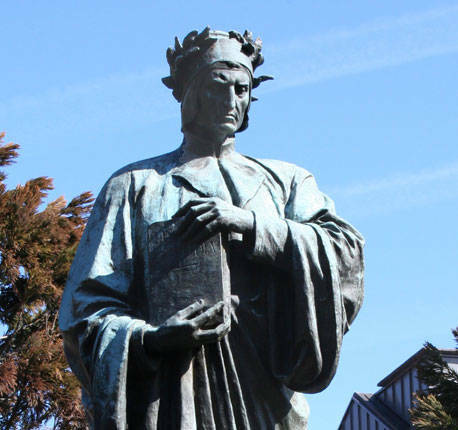 A large bronze statue of Dante that was gifted to the US from Italy can be found in Meridian Hill Park. Leonardo Da Vinci and Galileo statues can be found in the National Academy of Science Building. There is an Art Deco statue of Guglielmo Marconi on Sixteenth Street and another of Columbus at Union Station. Evidence of our American forefathers’ fascination with Italy can be found all around the Washington, DC area today. In a future article, I will discuss how George Washington laid the foundation for the American wine industry when he asked Filippo Mazzei to introduce the “culture of wine” to the United States, hence beginning our nation’s love affair with viticulture. Thomas Jefferson himself visited Italy as often as possible, as is evidenced in his Monticello. While entire books are devoted to this subject alone, Jefferson’s importation of Italian style didn’t end there. Many Americans are shocked to learn that it was the result of his smuggling riso di Pavia, rice from the town of Pavia, that lead to our $2-3 million-dollar rice industry in the United States. While the 16th-18th centuries remained a little- known chapter in the history of Italian-Americans in the United States, it was perhaps the height of Italian architectural dominance in Washington. Our urban planning relied heavily upon Italian artists, artisans, architects, engineers, stone cutters, painters, and masons. 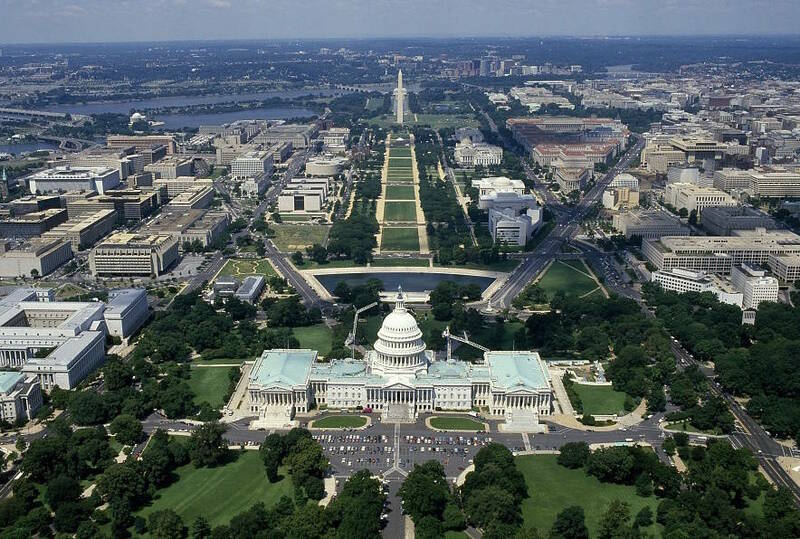 Constantino Brumidi, famous for designing the capitol building’s rotunda, became known as “the American Michelangelo”, and Andrea Palladio, “the most imitated architect in history” left Italian imprints on the DC area that cannot be escaped. The late architectural historian James S. Ackerman said that Palladio’s influence on the development of English and American architecture has been greater than that of all architects combined. Despite the fact that the majority of Italian immigrants had not yet arrived on Ellis Island, tributes and connections to their homeland were already being built in our nation’s capital. The city’s strong tie to the Italian sense of beauty has remained steady through modern times. Even the Watergate complex was designed by an Italian architect – Luigi Moretti. Our city’s current fashion, art, dining, decorating, and theatre scenes all boast Italian elements. Join me on a monthly journey through DC’s Italian roots while enjoying its contemporary Italian-centric culture. In the next issue, we’ll explore more of Palladio’s influence and the visions of Washington, Jefferson, and Madison with a trip to Barboursville, VA. After getting to know Virginia Wine Country, we’ll head into DC’s top Italian restaurants to find out how the capital’s chefs and sommeliers are putting local wine to good use! With this issue, Amy Riolo starts her regular collaboration with i-Italy from Washington, D.C. As an award – winning, best-selling, author, chef, television personality, and educator, Amy is one of the world’s foremost authorities on culinary culture. She is known for sharing history, culture, and nutrition through global cuisine as well as simplifying recipes for home cooks. A graduate of Cornell University, Amy is considered a culinary leader who enjoys changing the way we think about food and the people who create it. 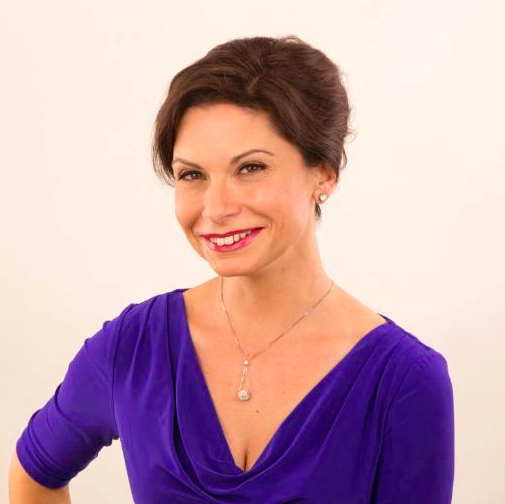 Amy is a food historian, culinary anthropologist and Mediterranean Diet advocate who makes frequent appearances on numerous television and radio programs both in the United states and abroad. Amy’s seventh book, The Italian Diabetes Cookbook was released on January 12, 2016 and was the #1 New release on Amazon.com. Amy, an American of Calabrian descent, was awarded the 2015 wise woman Award from the National Organization of Italian American Women. She is also a culinary Advisor for the Mediterranean food Alliance.